Throughout his career, Todd Berner observed inefficient practices associated with the former fee for service model commonplace in the healthcare industry. He was drawn to the concept of value, and how health care delivery could be improved. In recent years as health economics has become central to systems of healthcare., Todd Berner has emerged as a leading voice within in this field. Todd notes that value can be boiled down to a simple equation of quality vs. cost. Todd looks at the future of the industry with an innovative perspective hoping to promote ideas that demonstrate real world effectiveness, and not simply in highly structured studies. Todd has made significant contributions to the field of health outcomes and pharmacoeconomics, by authoring scores of scientific publications and presentations. His research has focused on three major streams of investigation, patient’s persistence and medication behaviors, quality and safety within geriatric populations, and the appreciation for patient centeredness and the role of patient engagement within outcomes research. As an engaged member of the healthcare community, Todd Berner holds many esteemed positions in a number of well-known organizations. He primarily seeks to advocate on the behalf of patients, placing particular emphasis on patient centeredness, patient engagement, patient safety and health economics. As Co-Chair of ISPOR Patient Engagement, Todd is deeply entrenched in healthcare issues facing patients today. Believing patients should be represented in every stage of their care, The ISPOR Patient Engagement SIG seeks to wholly involve patients in every step of their treatment. The American Pain Society is a community of medical professionals wholly dedicated to providing pain-relief and prevention solutions to all. By spreading awareness through education and public policy, this group chiefly aims to universally reduce pain-related suffering. As chair of the Pain Management Working Group, an organization under the umbrella of Pharmacy Quality Alliance, Todd Berner stood of the frontline of the most pressing concerns facing palliative care today. He composed solutions, held discussions, and contributed research to ultimately enlighten patients and others about the palliative care industry. The Pharmacy Quality Alliance’s mission is to improve healthcare quality and patient safety primarily through the use of appropriate medications. The Medical Science Research Liaison Group wishes to encourage discussion, debate, and informational gathering revolving around the medical industry, from pharmaceutical issues to the veterinarian community. In particular, Todd Berner has chosen to focus his expertise on improving patient outcomes for the thousands of Americans suffering from rare diseases. Often, these individuals are isolated and have difficulty communicating with professionals or other patients that may have the knowledge they need to help them. Todd believes that, through the use of technology and building better experiences in care centers, healthcare organizations can vastly improve the lives of patients with rare diseases. He is involved with a number of organizations that deal with Health Economics including, but not limited to, Patient Engagement in Research Special Interest Group for International Society For Pharmacoeconomics and Outcomes Research (ISPOR), Patient-Centered Outcome Research Institute (PCORI), and the Pharmacy Quality Alliance (PQA). Todd had spoken at numerous conferences dedicated to the furthering of patient advocacy, including the Medical Affairs Leaders Forum in Zurich. Outside of work, Todd Berner enjoys running, playing soccer, and generally staying active. Prior to his time in Chicago, he spent more than a decade in New Orleans. He holds a Bachelor of Science from SUNY Albany, and studied in Mexico and at Stony Brook University Health Sciences Center School of Medicine. 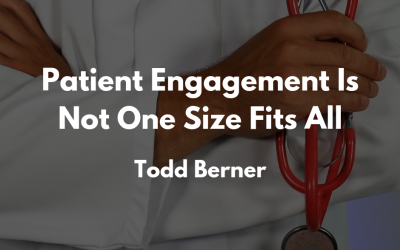 As a thought leader in the healthcare community, Todd Berner has been fortunate enough speak at several different public forums. With a firm understanding of and passion for quality improvement initiatives, both patient and otherwise, he is qualified to speak on a wide range of prevalent issues in the medical industry today. The Accountable Care Organization (ACO) strives to deliver “high-quality and cost-effective” care in the increasingly competitive capitalistic marketplace. This groundbreaking event will provide a platform for ordinary organizations to draw on the expertise of healthcare professionals.